Pirelli has been producing car tires since 1901. In 1907, the first Grand Prix of the Automobile Club of France was won by a car fitted with Pirelli tires. 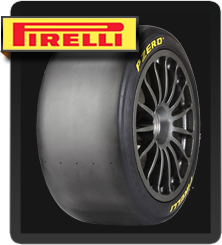 In 2011, Pirelli became the exclusive tire supplier to Formula 1™. Pirelli is also involved in other prestigious single-brand championships, like the Ferrari Challenge, which has used Pirelli tires since its inception, and more recently the Trans-Am series. Pirelli racing slicks can be found at most racetracks around the world.